Select UPS GROUND shipping on checkout for FREE Freight! Choose between 110V and 220V models. FREE SHIPPING ON YOUR PUGMILL! When you select UPS Ground on checkout. Large Hopper: The oversized hopper door allows for easy loading of up to 25 lbs. of clay per batch. Stainless Work Surface: The stainless steel work surface creates a durable work surface for convenience of the operator while loading. The work surface is 12" x 14". Corrosion Resistant: Peter Pugger now offers a corrosion resistant model (optional) for potters using porcelain clay bodies with high alkalinity. Click here for more information "What you need to know about Porcelain"
-Reclaim scrap - wet or dry. -OR just mix a 25 lb. bag of clay - literally warm the clay by mixing it. Vacuum is provided by a 1/16 HP double-headed rocking piston type diaphragm pump. These new technology pumps are the simplest and quietest vacuum source available. They are maintenance-free and long lasting. 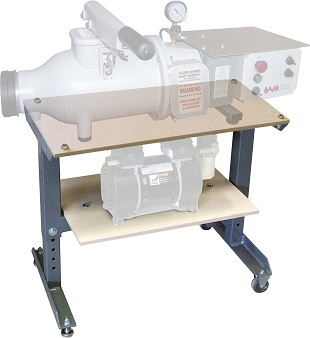 The VPM-9 Power Wedger does not require a large vacuum pump because the clay is continuously exposed to vacuum in the sealed mixing chamber.Once the clay chamber is evacuated, the vacuum pump can be turned off. With the removal of four bolts, the entire mixing/pugging chamber can be removed so it can be conveniently washed off. The paddles are then easily accessed for cleaning. Cleaning is necessary only to avoid cross contamination. Since the machines are completely sealed, moist clay can be stored indefinitely without drying out.